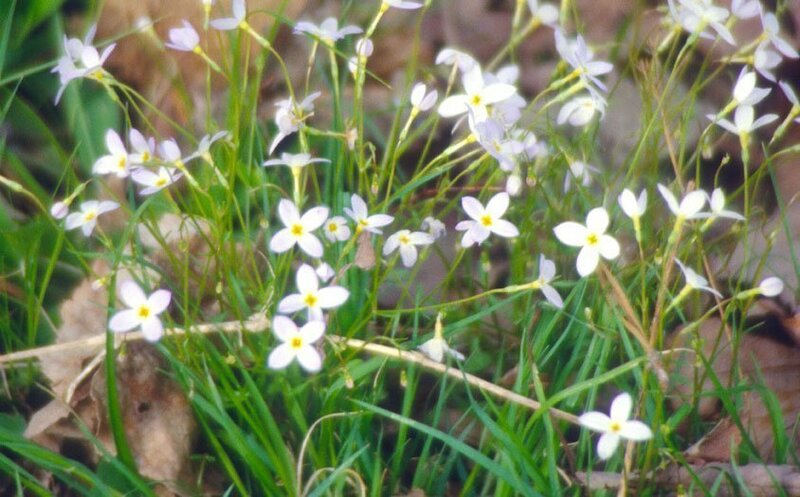 In the woods, before the deciduous trees leaf out to produce shade, the sun begins to warm the soil and triggers the emergence of spring ephemerals — unique wildflowers that have a short presence on the forest floor. These perennial plants rapidly send up foliage, blossom, set seed, and disappear in a few weeks. Searching for these first wildflowers of the year is one of the highlights of the gardening year. This white-flowering ephemeral seems to glow under the warm rays of the late winter sun. The two-inch wide, showy flowers have a prominent yellow center. Native Indians used its red roots for dye and war paint. 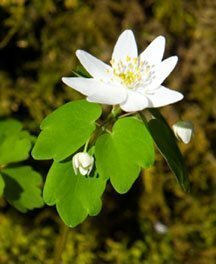 A delicate woodland perennial, Rue Anemone features pink or white blossoms rising above a whorl of dark-green, 3-parted leaves. The leaves are similar to those found on meadow rues. 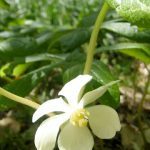 A unique plant, Mayapple has two umbrella-like leaves and one white flower, which grows in the axil of the leaves (where the leaf stalk attaches to the stem). 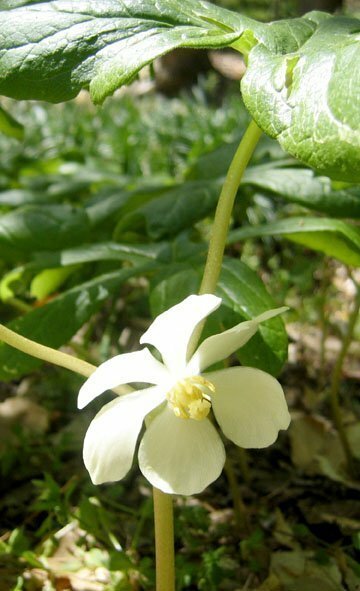 Mayapples are showy and colonize easily by rhizomes, forming clusters throughout the forest. Another much loved white-flowering ephemeral, White Wake-Robin takes seven years to journey from seed to flower. 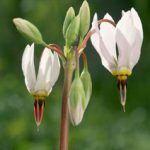 The showy, three-petal blossoms of white, which eventually turn pink with age, rise above the forest floor on 12 to 15 inch single stems highlighted by three green, leaf-like bracts. One of the first ephemerals to emerge, Liverwort is named such because its shiny leaves supposedly resemble that organ. A multitude of light blue to lavender one-inch wide flowers makes it easy to spot on the forest floor. The small, delicate pale blue flowers with yellow centers can be seen clustered in striking patches of light blue. 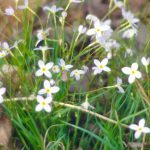 Azure bluet can expand across a broad area of the forest, growing in compact tufts eight inches tall. 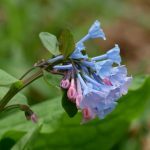 If your woodland rambles include floodplains, you may be fortunate to encounter colonies of Virginia bluebells. 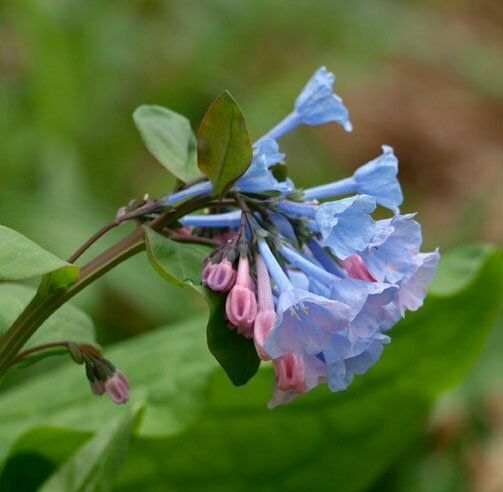 Its soft-magenta flower buds open to beautiful bell-shaped nodding clusters of blue flowers. It puts on a spectacular show when grown in masses. 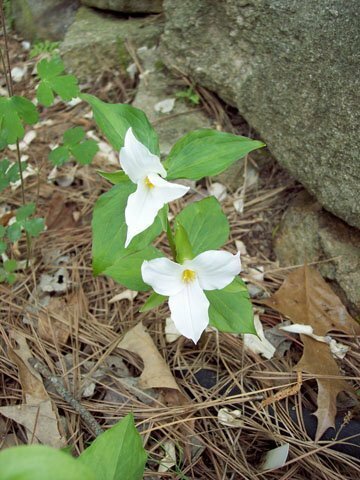 Indigenous to creek banks, the plant’s mottled leaves resemble the markings of brook trout. Golden-yellow bell-shaped flowers have long red stamens and recurved petals (petals that curve backward or inward). 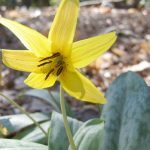 Large colonies of Trout Lily may be over 100 years old. 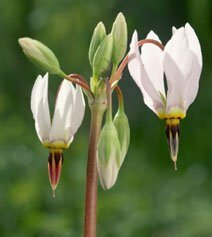 Another spring ephemeral with recurved petals, the five petals of the flower sweep back like the tail of a shooting star, which gives the plant its name. Native bees, the chief pollinators, must extract pollen by vibrating their bodies against the narrow tube, shaking the pollen out. 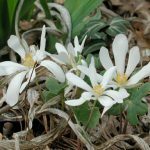 To enjoy these wildflowers in your garden, site them in well-drained acidic soil in the dappled sunlight of deciduous trees. Prepare the soil by adding 4 to 6 inches of compost to 4 to 6 inches of soil. Plant the rootstock two to three inches deep in early spring. Corms can withstand summer drought, but must have some moisture in spring and fall. 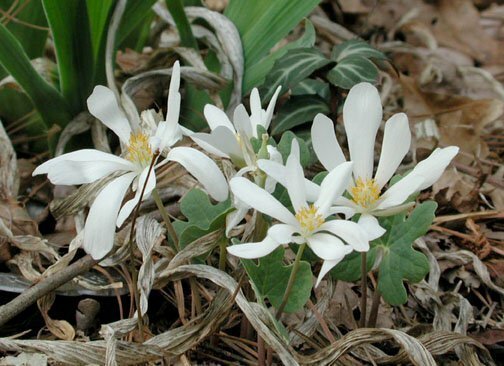 To conserve moisture, mulch the plant in early spring using finely shredded leaves. Organic fertilizer can be applied just as flower buds begin to appear to encourage a bigger and longer floral display. 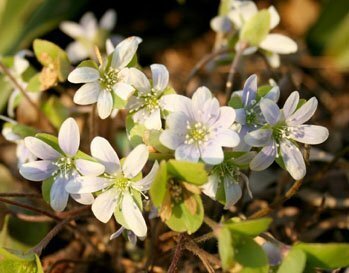 Make sure to seek out nursery-propagated plants; removing ephemerals from the wild endangers plant populations and damages habitats. 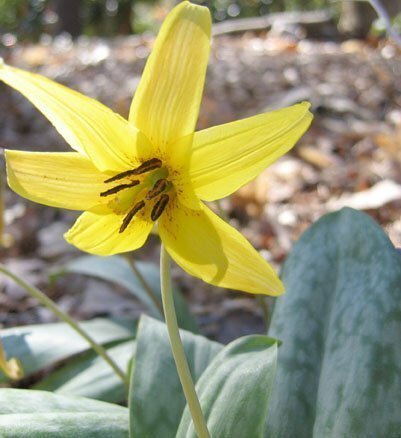 Visit www.ncwildflower.org for recommendations of reputable sources. 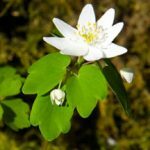 There are a number of local gardens and preserves where you can see spring ephemerals in late winter and early spring. 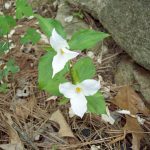 Visit Swift Creek Bluffs and Hemlock Bluffs Nature Preserve in Cary or along the Eno River at Penny’s Bend Nature Preserve in Durham. 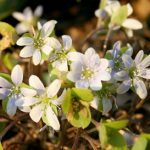 You can also visit the H. L. Blomquist Garden of Native Plants at Sarah B. Duke Gardens in Durham, the Joslin Garden and the JC Raulston Arboretum in Raleigh or the North Carolina Botanical Garden in Chapel Hill for a chance to see nature’s beauty as it was meant to be.